I've been working on these temari for ages. They look like a multi petalled flower. The blue one is really large and although it is STILL not finished I decided to share it anyway. This temari design is a big commitment despite the fact it is a simple division. This temari took me a week of dedicated stitching back in October to get one side done (I've misplaced the threads for it so I need to find them before I complete it). 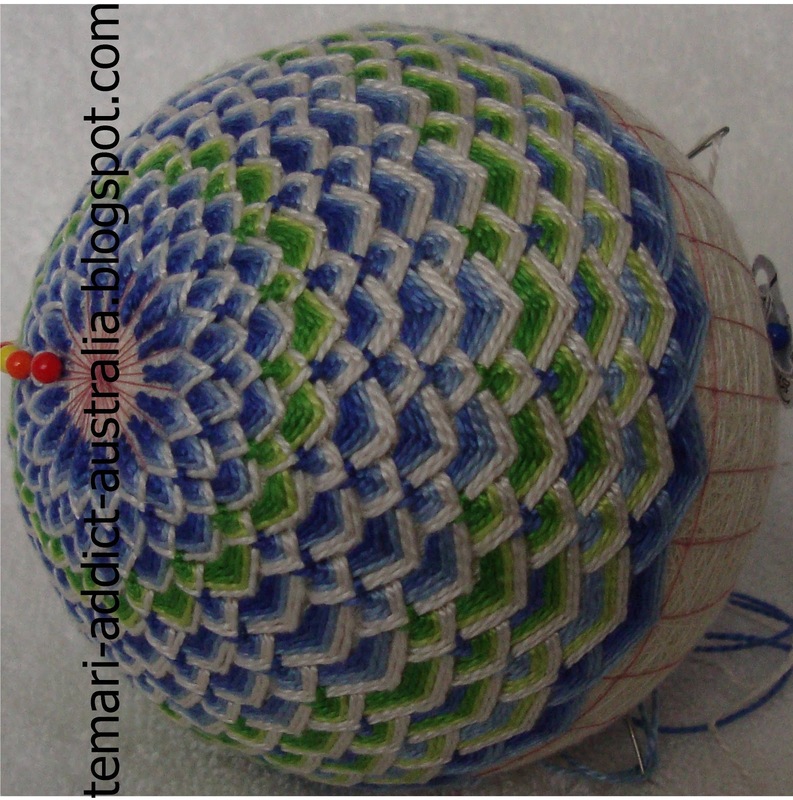 One of my temari friends shared a photo of a temari made with this pattern. It took me a good while to decipher the pattern, but I think I've got it. The temari below is my take on making the temari less consuming to stitch. 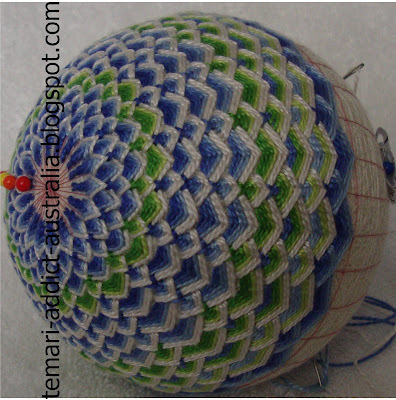 Fewer divisions on a smaller temari means it is quicker to stitch up. Still it took me a week to stitch this one. There are two different sides on this one. Can you spot the difference? Besides the one on the left being slightly out of focus that is. I am about to begin a new version of this one with a couple of extra divisions to make it look a little more lacy. School goes back in 3 days so I will have more time to dedicate to stitching again. Oh my Rebecca! It is beautiful. I can see where it would take a ton of thread. I was recently experimenting with a technique similar to this but my experiment went in a different direction. I love the 'spot the difference' puzzle. :-) I think I've got it but I'll wait to see if you share with us so I don't spoil it for anyone else.